The SGP-600 adds on modernistic appeal by processing its nickel plated cabinet the same way acoustic pianos do theirs. 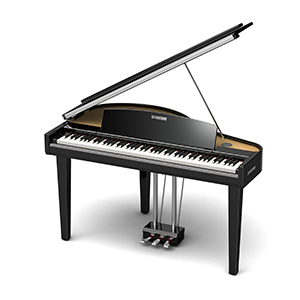 While maintaining the beauty of grand piano looks, its compact and slim cabinet design allows it to be used in family settings where space is limited. The majestic sound of 2 channel 6 speakers booming out of its refined compact body is yet another appeal of the SGP-600.